Political parties raced to the unpredictable final stretch of campaigning on Tuesday, as voters braced to pick the country’s 20th National Assembly that will be tasked with reviving economic growth, addressing security and diplomatic quandaries and setting the political groundwork for next year’s presidential election. Wednesday’s parliamentary race is being held after months of delays in negotiation over electoral maps, heavy in-party feuding over nominations and a number of cross-party membership swaps among candidates. Voter turnout is anticipated to be one of the biggest factors for the winning party as they vie for the majority in the 300-seat Assembly. The general election will run from 6 a.m. to 6 p.m. at over 13,000 polls across the country, according to the National Election Commission. Voters can locate their voting booths via the brochure previously mailed out by the election watchdog, or by typing in the name of their district in key portal websites. Once at the polls, they are to show personal identification, sign the electoral register and receive two pages of ballot papers, one listing the district’s candidates and another showing the political parties running in this year’s election. The latter will decide the parties’ approval rating and consequently allocate the number of proportional representatives. According to NEC data, this year’s electorate consists of some 42 million nationals, up 4.7 percent from the last parliamentary election in 2012. The 5.1 million who cast their ballot in advance during the early voting from Friday to Saturday last week are excluded from Wednesday’s main vote. While the outcome remains hazy due to close races in many constituencies, ranking political parties devoted their last reserves of strength to canvassing metropolitan areas. 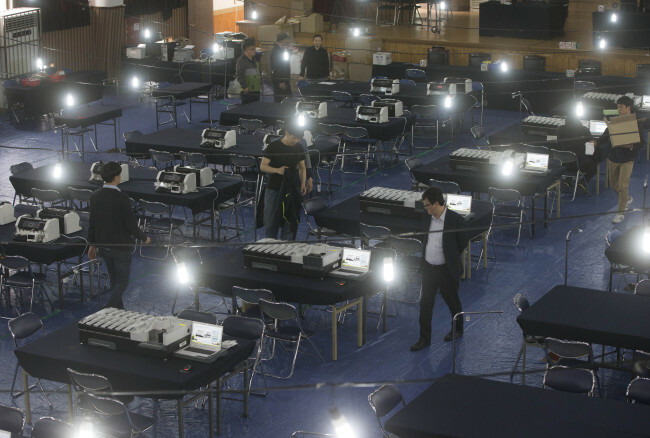 Leading political parties spent the last legitimate day of electioneering on rallying votes in the Seoul-Gyeonggi zone, which contains nearly half of the nation’s constituencies and the largest ratio of undecided swing voters. “Our party will face a momentous crisis, unless those who care for us step out and vote, helping us achieve the parliamentary majority,” said ruling conservative Saenuri Party’s chief Rep. Kim Moo-sung, stumping for party candidates in Suwon, Gyeonggi Province. Kim also mentioned the increasing military threat from neighboring North Korea, in a bid to remind voters that economy and national security have always been within the conservative camp’s forte. Expressing concerns on the relatively low early turnout in the party’s stronghold regions and on the decrease of political zeal from elderly age groups, the senior politician continued to call for union and action from conventional advocators. Regardless, the ruling party is inwardly anticipating achieving its target number of parliamentary seats, or more, thanks to the split of opposition votes. The Saenuri Party, which was once forecast to take as many as 180 out of the 300 seats, has lowered its ambitions to 150. The party’s chief election strategist Rep. Kweon Seong-dong, however, claimed that the detailed estimation as of Tuesday was about 145 seats. The main opposition, The Minjoo Party of Korea, is hoping to make it over the 100-seat mark, possibly up to 107, which is the figure that party chief Kim Chong-in pledged to achieve. The lower limit for the party is 90 seats, in which case it will have yielded most of its longtime stronghold electorates in Gwangju and Jeolla provinces to the fledgling minority People’s Party. Party spokesperson Kim Sung-soo said in a radio interview Tuesday that the party is not likely to make it over 100 seats, even assuming victory in tightly contested areas and including proportional representatives. With such sense of crisis, the party’s incumbent and former chiefs Kim Chong-in and Moon Jae-in urged voters to gather forces for the main opposition party so as to curb the political monopoly of the ruling party. “If (voters) uphold an unqualified opposition party, it will only act in the benefit of the Saenuri Party,” said Kim, referring to the People’s Party, which has been undermining his party’s votes. Rep. Moon, during his eleventh-hour visit to Gwangju, demanded that voters cast their ballots for Minjoo Party candidates in their districts and divert their party approval ballots to other minority parties. His approach was taken as a second-best plan, in awareness that the “Honam” region, which has been growing apart from the main opposition party, would not readily give out both of their votes. The People’s Party, on the other hand, is confident of winning in the southwestern Gwangju-Jeolla belt and has eyes on buoying its parliamentary seat number to 35-40. Its current figure is 20, the minimum number required for a party to constitute a parliamentary bargaining unit. Meanwhile, the party’s election teams remained tense on the weather circumstances, as the Meteorological Administration forecast rain on polling day. According to private weather forecaster K-Weather, the turnout in past parliamentary elections fell under the influence of the weather. In the 1996, 2000 and 2004 elections, when the weather was sunny, the nation’s average turnout stood at around 60 percent. Over the past two recent elections, however, the figures fell to as low as the 40 percent range. The impact is expected to be the most conspicuous for senior citizens aged 60 or more, who account for 23 percent of the nation’s entire electorate. The age group, however, has been less enthusiastic over voting. A public survey conducted by the NEC showed that 75.7 percent of the 60 or older group were actively willing to vote, which was down 4.9 percent from the last election.